Some people barbecue on Memorial Day. Others go for a little swim, bike, and run to celebrate the three-day weekend, barbecuing themselves in the hot Austin sun. Whether you're watching or participating in this year's CapTex Tri, stop by ATC to check out our Memorial Day sales, including 20% off wetsuits. You can also sign up for the Cervelo E-Ride and test out your new dream bike. Stop by Austin Tri-Cyclist and enjoy some savings. Get the smoothness of carbon and all the accessories at a price that saves. A great entry level road bike with a lot of extras. A Full Carbon Tri Bike and that's with shoes, pedals, helmet, and more! Your first tri bike and the gear needed to get you on the road at a low price. Comes with shoes, pedals, helmet, and more. Upgrade to the 2009 Jamis Comet for only $100. 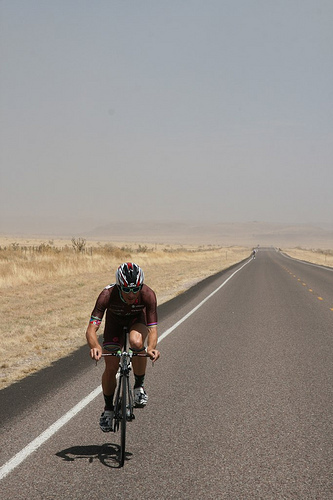 The Fort Davis Hammerfest Stage Race, put on by the Permian Basin Bicycle Association and Peyton's Bikes, has been around in one form or another since the early 1970s. It's been held in its current format – hill climb, time trial, and road race – since 2003. This year, however, was very different. 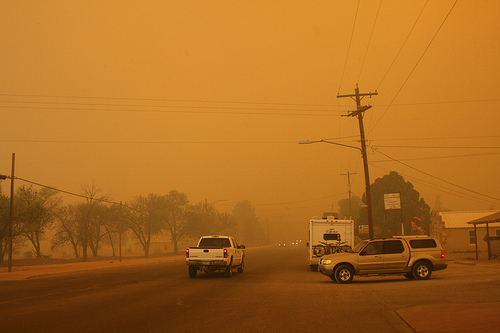 The first day of the race coincided with the largest recorded grass fire in Texas history. A challenging and popular race, Hammerfest draws cyclists from every corner of Texas, as well as parts of Mexico and other Southwest states, in spite of the remoteness of its location. Fort Davis, pop. around 1,050, is 7 hours from Austin and 9 hours from Dallas. The closest large city is El Paso, and that's still 3.5 hours away. In sum, Fort Davis is a long hike from anyplace with traffic problems that don't somehow involve a cattle stampede, and on the way there, it's a good idea to keep a careful eye on your gas gauge. But this remoteness makes for absolutely beautiful riding. After seeing hundreds of miles of dry, barren flatness flash by from the interstate, you almost forget that hills can exist, but as you head south toward Fort Davis, the land begins to buckle and rise. At 5,050 feet above sea level, Fort Davis is the highest town in Texas, and while it's still within the Chihuahuan Desert, the elevation gives it a unique mix of alpine and desert qualities, including much cooler temperatures than surrounding areas. And not only are there spectacular climbs and scenery, but the roads are empty and the locals are incredibly friendly. In addition to cyclists, Fort Davis is a popular stop for bikers (no, the other kind), campers, RVers, history buffs, and retirees, and tourism is the town's main industry. The weekend of Hammerfest, Fort Davis is teeming with roadies and triathletes – they're in the cabins, inns, dude ranches, restaurants, and streets, and if they're not riding or carrying a bike, you can still spot them by their Oakleys and compression socks. The turnout is good, the purse is substantial ($7,000 awarded in cash), and the setting is a vacation in itself, but Hammerfest is also subject to the elements. Don't let the high-speed internet and posh accommodations fool you: in many ways, West Texas is still very much a frontier. My husband and I, scheduled to start late in the day, heard about the fire on the radio when we were driving to Davis Mountains State Park. The fire had just started west of Marfa, the station announcer said, and was spreading quickly with the 28mph wind. Initially, Fort Davis wasn't mentioned beyond a cryptic warning to "stay alert," but when we drove along the park's Skyline Drive, a giant plume of smoke was visible at the horizon. When there's a disaster, you expect it to look and feel like a disaster – you expect sirens, maybe, and people running. But on the way back through town, everything seemed normal, with just a faint smell of burning. We drove out to the time trial start, and there the sky seemed darker and ash was floating in the air, but wheels were still rolling so we shrugged it off and went back to our cabin to get ready. Wildfires are par for the course in West Texas, but last year's rain and growth in vegetation, combined with this year's dryness and the strong winds, made for an extremely destructive and uncontrollable blaze. 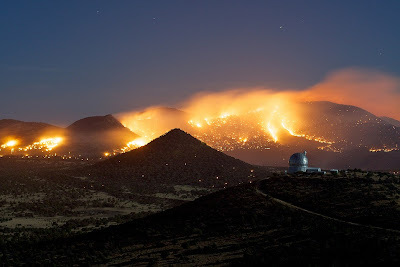 In fact, up until the first week in May, the fire that started on April 9 was still burning, consuming a total of 314,444 acres (approximately 500 square miles). Lisa Anderson, long-time member of PBBA and race official, was working the halfway point of the TT course that afternoon. "There was a crazy tailwind," she says. "It was so slow going out there, but then the riders would make up a ton of time on the back half. It was taking some of the Pro 1/2 guys 30 minutes to get out there and 10 minutes on the way back." Lisa says the volunteers there, accompanied by a sheriff's deputy, watched the fire pretty much from the start. "We could see a thin plume of smoke behind us, and we watched it as it spread," she says. When the deputy gave the official word to clear the course around 3:30pm, the volunteers drove along the route and waved riders back. Shortly after the course was cleared, fire jumped the highway at the TT finish line, turning the portable toilet located there into something resembling a modern art sculpture. The officials and townspeople had held out as long as they could. Needless to say, the rest of the race was canceled, and the town was evacuated, piece by piece. 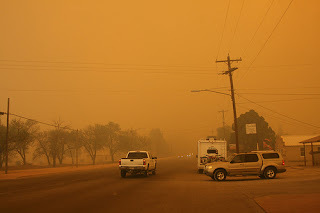 When my husband and I were told to leave, the sky was filled with billowing, reddish-brown smoke, and the lighting was decidedly apocalyptic. As we drove past the hill that had been blocking our view from the cabin, we saw that the fires had advanced to no more than a quarter mile from the highway. People were parked along the side of the road, watching and taking pictures, and I realized that some of them must have been from the subdivision across from us, and that they were about to see their houses, and everything in them, burn to the ground. For us and for the other cyclists at Hammerfest, the fire presented a disappointment and an inconvenience. For the people from Fort Davis, it was a tragedy, destroying 50 homes and killing herds of livestock, though fortunately, no human lives were lost and most of the town's historic buildings were saved. Perhaps the only redeeming feature of such an event is the generosity it can inspire in people. We heard later that Hammerfest officials gave out all the water bottles and food intended for the event to workers. Also, donation jars were set up at cycling events across the state, and as of April 15, a little over $18,000 was donated to Fort Davis, including a $5,000 contribution from TXBRA. One of the ways you can continue to help the Fort Davis area is to visit. Local businesses would be happy to see you out there on two wheels, whether you're on a training ride or participating in Cyclefest or next year's Hammerfest. During your visit, be sure to also check out sights like the McDonald Observatory, Fort Davis National Historic Site, Prude Ranch, Hotel Limpia, and the Fort Davis Drug Store, an authentic old time soda fountain. Keep in mind, however, that with the continuing drought conditions the risk of wildfire is still high. Though the Rock House Fire is now 100% contained, having consumed approximately 1/4 of the county, another 3/4 of prime tinder remains. This problem continues across the state. Since fire season started in November, 10,123 fires have burned through 2,589,303 acres. Currently 200 of Texas' 254 counties are under a burn ban. This June, the Mineral Wells Summer Time Trial, hosted in an area about 100 miles west of Dallas, will cross through a "lunar" landscape destroyed by another recent wildfire. On a personal note: To regroup after the escape, my husband and I stopped at La Trattoria, a restaurant in Alpine, which had become something of a refugee camp. Everyone there seemed to have come from Fort Davis – many were tourists, like us, and some were waiting it out until the roads opened again. I'm ashamed to say that I can't remember their names, but to the cyclists who gave us a free hotel room in Alpine, we'd like to offer our sincere thanks, and to Jack Willis, a local who shared his stories from races past, we hope you and yours made it through safely. Time trialing began in the late 1800s in England as a response to a national ban on road racing. At the time, instead of conflicts being between cyclists and cars as they are today, it was often cyclists and people on horseback. After some accidents and subsequent complaints, cyclists in England were in danger of being banned from the roads completely, and racers were seen as a threat that could inspire legal action against all cyclists. To prevent that eventuality, the National Cyclists' Union prohibited racing on the road, hoping to keep the races to the velodrome, just as car enthusiasts today encourage kids to keep the racing on the track. Few velodromes existed, however, so underground organizations formed and began a new racing format that they hoped would not attract so much attention. The first time trial on public roads may have been in 1895, when Frederick Thomas Bidlake organized a 50-mile race against the clock. Drafting was not yet against the rules in these races, but riders were set out at 2- or 3-minute intervals, with the fastest going first, so drafting was unlikely to occur. Over time these events evolved into races of 10, 25, 50, and 100 miles, with records being tracked for each one. That 25-mile distance, when converted to the metric 40 kilometers (24.85 miles), would become the 40k TT we know today. 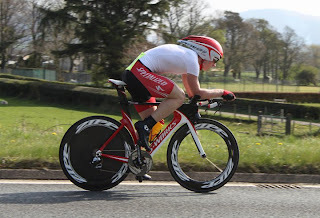 Perhaps by accident, or perhaps inevitably, the 40k TT comes up again and again as a relevant and important distance not just in cycling, but in triathlon as well. 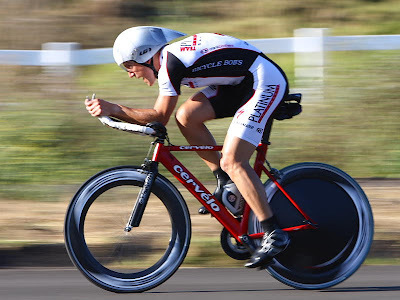 State and National Championships - The 40k TT is often the standard distance used in regional and national time trial championships. Any cyclist interested in winning the yearly TT championships in his or her category will have to focus on this distance. In some regions the women do a shorter distance, but in Texas, women do the same course (because Texas is awesome). The Gold Standard - The Hour - In days gone by, when the 40K was actually 25 miles, and when time trial bikes had round steel tubes and bullhorn bars and wheels had spokes, going under an hour for 40k was seen as a gold standard for cyclists. If you could do that, you were serious business. Since then, equipment has come a long way, and a sub-hour 40k won't even always win a cat 5 TT. However, for triathletes, who spend a large portion of their training time running and have to carry around an upper body that is actually useful so they can swim, breaking an hour is still a gold standard. Going sub-hour is proof of studly-ness (on the bike, at least), especially if done in the course of an Olympic distance triathlon (but only if you don't blow up on the run). Functional Threshold Power (FTP) - FTP is defined as the amount of power a cyclist can average for one hour. This happens to be an interesting physiological power level, as it represents the crossover point between an almost entirely aerobic power output, and a power output that starts eating into anaerobic reserves that will eventually fatigue you. Cruise around at slightly less than your FTP and you can go for a long, long time. Cruise around slightly above it and you will soon blow up. Many coaches and athletes use this metric to set up training zones. There are many ways to estimate your FTP but the one way to get it exactly right? Go as hard as you can for an hour. For most people, a 40k TT and a power meter will be the best way to do that. To geek out further - Go Here. Olympic-Distance Triathlon - One of the most popular distances in triathlon is the Olympic distance, when it first starts to get serious. The bike leg here is 40k, with a 1,500m swim before and a 10k run after. Age group athletes who can break an hour mid race have a good chance of starting the run in the lead. Also, while they rarely time trial it solo, ITU athletes making their bid for the Olympic games also bike this distance in their draft legal format. Iron Haus Time Trial Series - First Saturday of each month - Great out and back course with a wide shoulder the whole way. Located just west of San Antonio in Castroville Texas. You only need to touch the brakes once at the turnaround. It's an informal event, so you can sign up online or the morning of. Horse Country TT Series - May 14 and July 17 - Located in Aubrey, TX, this TT course features smooth roads, wide shoulders, and a bit of climbing. CapTex Triathlon - May 30 - One of the biggest triathlons in Texas. The CapTex bike course is in downtown Austin. It is a twisty, crowded, multiple-loop course that will test your handling skills as well as your threshold power. Somehow this course remains fast despite the turns and crowds, perhaps due to the constant draft affect of passing slower waves. Marble Falls Triathlon - July 17 - A wee bit short of 40k at 23 miles, but another beautiful bike course with no loops and no crowds. A big uphill to start things off and a fast downhill to finish it. The Small Texan Triathlon - July 24 - Is 40k not quite enough? Runner studs got you down? This smaller event in Boerne, Texas, just outside of San Antonio, adds an extra 5k to the bike course for this otherwise Olympic-distance event. It will be hot, there will be no shade, but there will be a great course with beautiful water to swim in before you bike. Texas State Time Trial Championships - July 30-31 - Details TBD but this event usually takes place somewhere in Central Texas near San Antonio. Anyone can sign up and they even include a multisport category for triathletes and duathletes. There is also a team competition the following day. 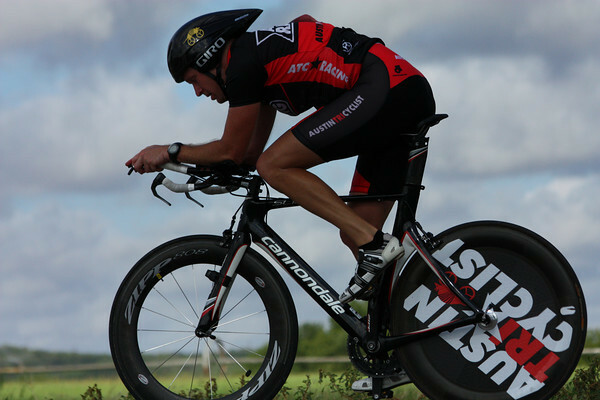 The Austin Triathlon - Sept 5th - Another huge event with tons of quality competition, The Austin Triathlon takes place in the same location as CapTex with slightly different courses. The 40k bike has the same challenges of twists and traffic, with multiple loops. The Houston Triathlon - Sept 25 - A standard distance event near Houston. A 40k Time Trial is an exercise in pain and patience. Athletes who go out too enthusiastically will explode enormously. The best way to pace it is an even effort with perhaps a little kick in the closing minutes. It takes great pain tolerance to keep that effort up all the way through. A bike computer can help you pace if the course is flat and winds are low. A power meter is even better; if you know your FTP you can just hold your average power right at it (easier said than done!). Click here for a sample power file of a perfectly paced, sub hour 40k. Stop by ATC and ask about power meter or bike computer options. Even better, stop by ATC any time and head upstairs to the trainer cave and make use of the ATC Computrainers for free! Just ask Don or Adam to help set you up. Training for a 40k TT will be pretty familiar to triathletes who are used to constant, evenly paced efforts. Cyclists may want to take a break from short intervals and sprinting in the weeks leading up to a big event. One popular workout is to do 2x20minute intervals at threshold power. Get aerodynamic! We covered most of the key tips here in our Victory by a Thousand Cuts in February. Be sure to clean that bike of clutter and remember you will need little, if any, water for a 40k TT. For 2011, I decided to race a bike of races past, a bike even more antique than its predecessor, the infamous Stroobandt Flyer (a Cervelo P3 aluminum, circa 2003). For the Blue Norther duathlon, I raced on a HOTTA. If you're not familiar with this late 90s bike, in its time it was one of the best and most advanced frames out there. The Cervelo P4 of 1998, so to speak. 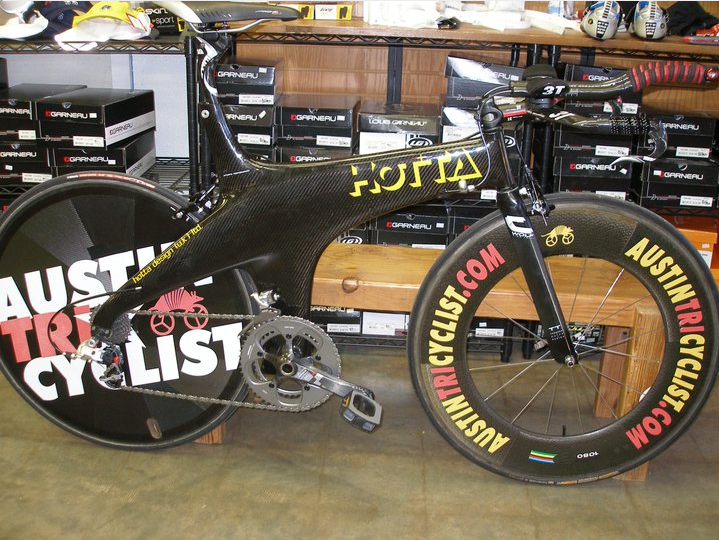 The HOTTA was in part designed by Chris Boardman, a three-time hour record holder. And it turns out, I wasn't the only one thinking retro this year – triathlon super star Bjorn Andersson also dusted off a HOTTA and raced it at the renowned Abu Dhabi triathlon this year. I wanted to do the bike justice, so decided to add on a SRAM red drivetrain, a 3T Brezza front end, and Zipp wheels. Altogether, race weight came in at 18 pounds. Not bad for a frame that’s over a decade old! I was able to get my position dialed in using a profile design fast forward seatpost, and with the short head tube, I had no issues getting into a fast fit. So what you're probably really wanting to know is, how did it ride. It rode fast… I would gladly race this bike anytime. It was stiff, smooth, and I never felt like it was slowing me down. My legs, on the other hand, could have done better. In the end it was good enough to go home with first in my age group. 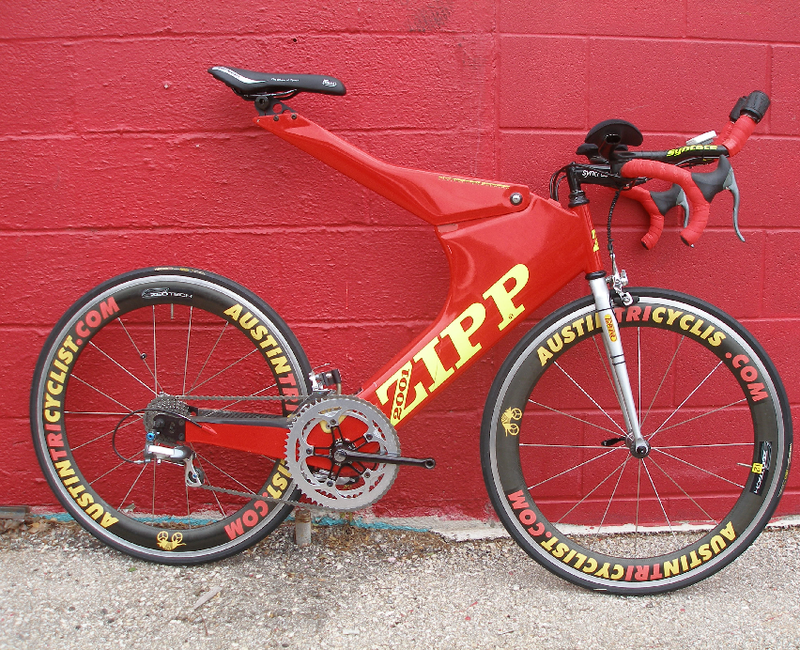 So next on my list of bikes….the Zipp 2001. This one I am thinking of keeping fairly retro for components. The shifters are grip shift, similar to a mountain bike. Too cool, right? 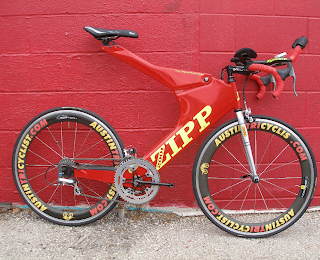 The Zipp 2001 was first made in 1992 and was kept on production until 1998. The Zipp 2001 is considered one o f the fastest frames ever made, along with the HOTTA and the Cervelo P4. Zipp stopped making the bike when the International Cycling Union (UCI, the pro cycling governing body) deemed the design illegal. Of course, you can still race them in triathlon. So all of you in the 25-29 age group, be afraid, because I'm rolling up with the not-so-latest, but still-the-greatest in bike technology! Stay tuned for the next retro bike. Also, you can swing by and see these bikes from the past at Austin Tri-Cyclist.